Mr. & Mrs. Sweeney of California became collectors of Canadian First Nations and Inuit art in the 1950’s, 60’s and the 70’s. “During our first trip to British Columbia, we visited the Hudson Bay Company store and saw long tables of Inuit sculptures of overwhelming beauty, and very low prices by today’s standards”. They came back to buy different pieces over the years from many different locations. They visited Vancouver, Victoria, Sidney and others. They met Chief Mungo Martin in Vancouver. This collection is extensive at 55 pieces and it contains pieces carved by Chief Mungo Martin from Fort Rupert, by John Ayak from King Island, Alsaska, by Sakaraiasase Nappartuk from Akulivik, Quebec, by Pudlo Pudlat from Cape Dorest, Nunavut, by Mary from Kidegate, Haida Gwaii, among many others. 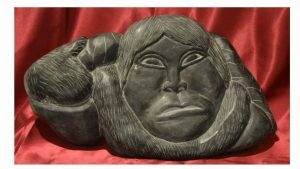 Some pieces are carved from cedar, caribou and walrus bone, whale vertebrae, caribou sinew, serpentine, argillite, steatite, ivory, and many soapstone works of art. The carvings are mainly of animals (seals, ravens, owls, geese, bears, walrus, dogs, etc.) with a few humans, masks, and totems. The Sweeneys chose to return these pieces to Canada as one entire collection. Mission Community Foundation is very pleased and proud to be the custodians of such a prestigious collection of Canadian First Nations and Inuit art since 2005. It is put on display for 1 month every summer at the Mission Leisure Centre.